Slow-performing websites can be detrimental for businesses who want to maintain customer-satisfaction, as well as gain revenue through their site. While it may not seem like a huge deal, websites with slow loading times can seriously affect a website's overall performance. People have short attention spans, and if viewers are forced to wait long periods of time to view your website, they may become impatient and close their browsers before even taking a look at your website. It is also seen an unprofessional for businesses to have slow websites, which is why it is important to learn how to speed up your site and keep your customers happy. Google also puts a high importance on site speed using that to penalize your search engine rankings if your site is too slow. If you are unsure of how fast your website is operating, use Pingdom as a tool to test your speed: https://tools.pingdom.com/ You want to aim for an approximate speed of two seconds or less. Another way to speed up your website is to install a caching plugin. Sometimes, websites can be operating slowly because of the time it takes to rebuild a web page. Pages are able to pop-up on your screen because Wordpress rebuilds each page from scratch, and if your website contains a lot of information, it may take longer for Wordpress to rebuild each page. In turn, it will take longer for visitors to view your web pages. Caching plugins can help improve your speed because they make a copy of each web page, and then sends it back to the client when visiting your website. Some free, effective caching plugins include W3 Total Cache, WP Fastest Cache, and WP Super Cache. It is important to note that you should avoid installing multiple caching plugins at the same time because that can lead to problems on your Wordpress site. Especially relevant to older websites, database cleaning plugins can also help improve the speed on your WordPress website. Overtime, your database will expand by gathering unused information, such as deleted / spam comments, data from unused plugins, website changes, and more. Your website slows down as your database expands, which is why regular database cleanups are necessary for reducing your database size and improving your website's speed. Some free, effective database cleaning plugins include WPOptimize and WP Clean Up Optimizer. While this may seem self-explanatory, it is important to disable and delete plugins that are no longer being used on your website. Every plugin on your website takes up space, even if they are no longer active. So, it important to get rid of plugins that are no longer being used to improve your website speed and overall performance. Having photos on your website can take up space and slow down your site, easily adding a few more seconds to your page load every time. Luckily, there are lots of free plugins that will compress your picture size without affecting the quality. Try using the "Smush Image Compression and Optimization" and "ShortPixel" plugins to compress images on your website. Overall, you can increase your website speed significantly by investing in good hosting, installing caching, database cleaning and photo compression plugins, as well as deleting plugins you don't need. 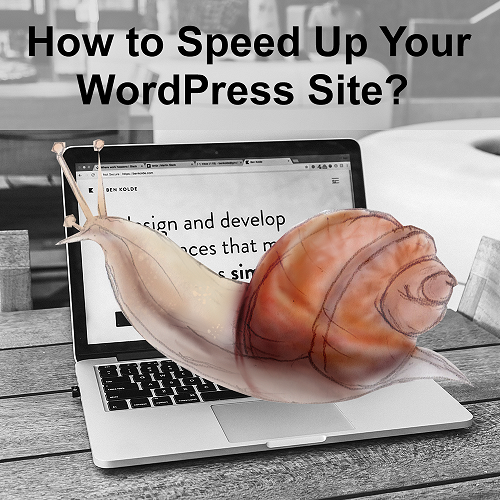 How to Speed Up Your Wordpress Website? | Computer Geek 5 out of 5 based on 103 user ratings. How to Speed Up Your Wordpress Website? - Slow-performing websites can be detrimental for businesses who want to maintain customer-satisfaction, as well as . . .